What Can Predictive Maintenance Do For You? A comprehensive predictive maintenance program consists of vibration monitoring, infrared thermography and visual inspection. MicroDAQ.com offers all the equipment you need to implement and maintain a successful predictive maintenance program. Analysis of these areas can reduce costly down time of machinery by scheduling maintenance only when it is needed. With the right tools you can predict when the machinery will require maintenance. Vibration Analysis – Vibration meters and loggers can identify a problem before the equipment fails by detecting misalignment or an imbalance of rotating machines. Defective bearings or loose parts are a few examples of problems that can cause an increase in vibration. 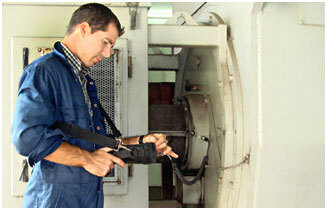 Visual Inspections – Stroboscopes and Tachometers are both helpful in this area. Stroboscopes allow slow motion or stop action visual inspection of rotating, linear or reciprocating objects. With the stroboscope you can visually inspect the parts of the machine for signs of wear or cracks without having to stop it. Tachometers are used to get RPM measurements. MicroDAQ.com offers both contact and noncontact tachometers.